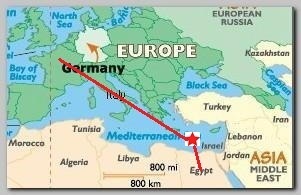 The aircraft was flying at 37,000ft (11,300m) when it went missing over the Eastern Mediterranean. An official said the plane lost contact with radar at 02:45 Cairo time (00:45 GMT). The EgyptAir aircraft left Paris at 23:09 local time on Wednesday (21:09 GMT) and was scheduled to arrive in the Egyptian capital soon after 03:00 local time on Thursday 05/19/2016. The company said it would issue an update “when more information becomes available”. EgyptAir said the plane disappeared about 10 miles (16km) into Egyptian airspace. An airport official, quoted by Egypt’s state-run newspaper al-Ahram, said the last contact with the plane had been 10 minutes before it disappeared – and no distress signal had been sent. It said the concerned authorities had been notified, and search and rescue teams were now looking for the plane. ** In 03/2016, an Egypt-Air plane was hijacked and diverted to Cyprus. The attacker later surrendered and all hostages were released. ** Greece’s defence minister said after few hours Flight MS804 made “sharp turns” and plunged before dropping off the radar. ** After debris of the aircraft found in search area near Karpathos Island. South-East of Crete, an Egyptian aviation minister Sherif Fathi has said at about 14:00 Egyptian time they believe it is more likely that flight MS804 was downed by a terrorist attack than a technical problem with the plane. * John Goglia, a former USA National Transportation Safety Board member, told the Associated Press, on Thursday evening Egypt time, early indications point more to a bomb than to a structural or mechanical failure behind EgyptAir flight’s crash. ** In France, the focus is on whether a possible breach of security happened at Paris Charles de Gaulle airport. After 11/2015 Paris attacks, some airport staff had their security clearance revoked over fears of links to Islamic extremists. Reporters learned that some airport staff had their security clearance revoked over fears of links to Islamic extremists. ** Smoke alarms were sounding for almost three minutes on board EgyptAir MS804 before it plummeted into the sea, investigators have confirmed, on Saturday 05/21/2016, as the first pictures of the mangled wreckage emerged from the crash site. Egyptian media have also reported on Saturday that divers have found the ‘Black Box’ between close to the crash site. The ‘Black Box’ has yet to be recovered by rescuers but could provide vital clues into what caused the plane to crash just as it entered Egyptian airspace on its journey to Cairo. ** EgyptAir pilots tried to put out a fire on board a plane that crashed into the Mediterranean Sea in May, investigators have said, on Tuesday 07/05/2016, after analysing a recovered cockpit voice recorder. The recordings were consistent with data previously recovered from the wreckage that showed heat, fire, and smoke around a bathroom and the avionics area – the part of a plane that houses electronic equipment.